We live just outside the village of Salzbergen in Germany near the Dutch border. My first dog was a German Shepherd from the animal welfare. Kadim was 8 years old when we got him and very obedient. My mom and I spent 6 wonderful years with him until we had to let him go. He was a great first dog and I still think of him often. Two years later Terrier Sam came ... I was not looking for a dog at all - but Sam found me. He was only 1.5 years old and was passed from one hand to the other. 5 previous owners were listed on me. So I adopted him. Sam has always been a difficult dog. He needed something to do, so we started with Agility. I learned a lot with Sam. Patience and consequence were no longer foreign words. By now Sam was 7 years old and I wanted to have a second dog. 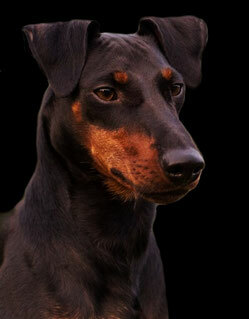 About the agility sport I got to know Manchester Terrier and different breeders. I immediately fell in love with this breed. Sputnik was the first dog I could accompany from an early Age. It's so much fun to watch a little whirlwind and show him the everyday things. I am very happy that my two males understand each other so well and wish me a long time with them.